The 27th Commercial Showcase featured stunning vocals and riffs from some of Belmont’s most talented students, who all highlighted their values throughout their performances. The first performer was Bethany Warner, known as Deza. Deza’s show was visually stunning throughout, including a head-to-toe glitter jumpsuit and lively backup dancers. She opened the show with a sassy original song titled “Bored,” which was inspired by a tweet. One of Deza’s most interesting performance qualities was her production. As the evening’s host James R. Wiggington noted, she creates impressive beats and tracks which drive her pop sound. After Deza, Nashville native Brennen Joy delivered a standout performance. His set was narrated by his grandmother, who emotionally discussed her experience as an African American growing up during the civil rights movement. He opened his set with his soulful original “Drag Race,” an evocative and powerful statement on racial inequality. Joy’s vocals were consistently stellar, but what most set his performance apart was his choice to perform “Lovely” almost entirely in the dark. This shifted the focus off of the look of the stage and performers and onto the music itself. The impact was mesmerizing. After the somber and passionate second number, “Henny in the Hamptons” re-energized the crowd, and Joy encouraged the audience to sing along if they knew it. Natalie Layne Merrill took the stage next, and she focused from the beginning on allowing her personality and passions to shine through her performance. She also reiterated a sentiment the other performers had also mentioned — being a songwriter is all about being attentive to details wherever you are. Her first song, “Deserve It All” kicked off with Merrill at the piano sharing honest and open lyrics. Her storytelling ability carried over into her second song, “Undo You,” which was inspired by sharing a journey of faith with a friend. While her visual production was less dramatic than the performers before her, her confidence and stage presence highlighted her vocal abilities. She closed with her new single, “Burn Every Ship,” an upbeat number she encouraged the audience to sing and clap along to. Ethan Thomas closed the show with “Jump Start,” an original song reminiscent of Stevie Wonder. While his explosive horn section occasionally overpowered his vocals, it helped his performance stand out from the rest. Haunting harmonies from his background vocalists launched his second song, “u Know” — a strong and emotional piano ballad. To close the show, Thomas showed off his impressive riffs in “Hit Me,” which also featured a stellar drum solo from Jasper Twigg. 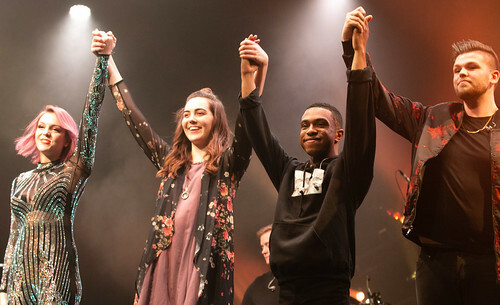 Overall, the evening packed in four passionate, powerhouse singers backed by equally talented bands that captivated the audience from start to finish. This article written by Melissa Kriz and Sara Scannell. Photos by Carina Eudy.